As an iTunes subscriber or Apple Podcasts member, each new Podcast will automatically be downloaded directly to your computer, iPhone, iPod, Android or any device of your choice. Get Apple iTunes Software by going to this page >> www.apple.com/itunes/download << or simply look for the podcast button if you have an iPhone. the podcast cover image below. Click “View on iTunes” on the left side under the logo. After iTunes opens Click and complete each of the following. ADD YOUR RATING AND REVIEW. 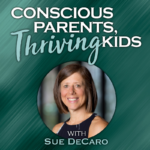 By doing these 3 steps, you help Conscious Parents, Thriving Kids rank higher in the iTunes directory so parents all over the world can listen in. Thank you for your subscription and review!